Hannah Henderson and John Moore are walking arm in arm, down a narrow Venice walk street shaded by trees. On either side of the pedestrian-only pathway is a row of cottages—in one front yard, a chicken meanders through the grass, its head bobbing as if to say hello. In another, two women, each with a barefoot child, halt a friendly conversation to wave; further down, a man paints in the window of a tiny art studio, raising an arm in neighborly salute. All of it—the greenery, the breezy camaraderie, the lack of footwear, and certainly the chicken—is enough to make one forget that this is Los Angeles. But moments later, the two emerge onto Lincoln Boulevard, a street abuzz with fast-moving traffic. There, at the corner of Superba Avenue is General Store, the shop they opened in the summer of 2012. 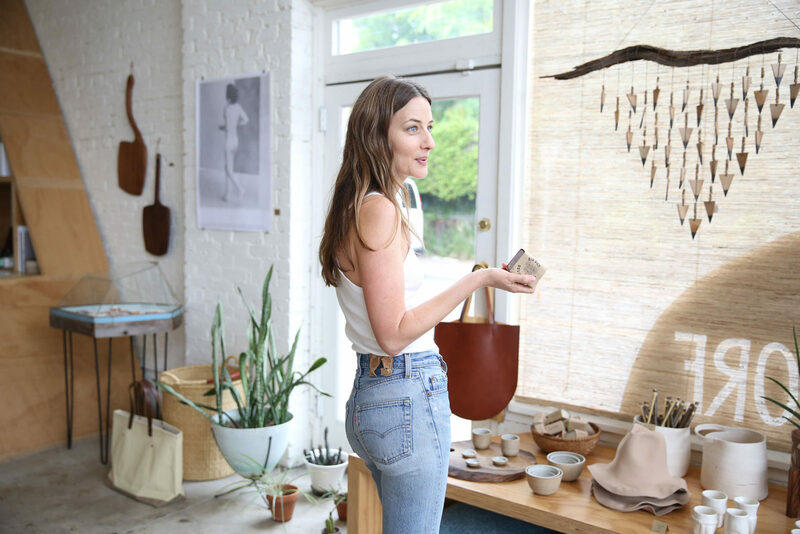 With its founding location in the outer sunset of San Francisco (with the couple’s friends, Serena Mitnik-Miller and Mason St. Peter at the helm), General Store has become a beloved source of vintage and handcrafted clothing, accessories and housewares, many of which are California-made. It’s warm, sunlit, serene—all words that could just as easily be applied to the couple’s home, a short drive away. Here they’ve raised a daughter and son, now 11 and 7, respectively, and have spent 14 odd years making it a better, more beautiful place to call home. They admit that though they treasure its history, its art, its proximity to the ocean, it often feels overcrowded. The city, too, they say, has its inevitable setbacks. This portrait is part of our ongoing collaboration with ZEIT Online. Head over to ZEIT Magazin Online to see more snapshots of Hannah and John’s world. But to John, born in L.A. at the same hospital as his father (and delivered by the same nurse), and Hannah, an L.A. resident since the day after graduating college, it’s difficult to imagine leaving. “When we travel, we realize how much we love it here,” Hannah says. “I’m always complaining how our house is really small and our kids are getting bigger and I really want more space. So we go away, but then when we come back, I think, I need to stop complaining. It’s amazing here.” She settles on a large cushion in the yard, the replacement for a hammock the kids destroyed long ago. Once again, in the quiet, in the shade, in the burning haze of early afternoon, the city disappears. Hannah, you’ve mentioned before that you never planned to open a store. When did the opportunity present itself—and what made it worth pursuing? Hannah: It’s true that I never thought I’d have a store. After the fact, it all makes sense, but it was never a goal of mine. It just happened. When I was young, I’d always worked in retail, and I liked being around things that I loved. I learned then that a store also brings like-minded people together, which I love. We’ve gained a real sense of community from the shop. To make a long story short, I met Serena, my business partner and the owner of our San Francisco location, through John. She was collaborating on a project with him and we found that we had a lot in common. I felt comfortable and connected to her. It was a very natural friendship. We opened the Venice shop here in August 2012. Much of what is sold here is California-made. How do you choose which artists and designers to stock, and what draws you to California products in general? Serena and I choose our products organically. We talk a lot about the things we love—if I fall in love with something, I’ll share it with her; when she loves something, she’ll share it with me. It’s a true collaboration. Most of it is California-made. We try to source everything here first. The store was founded on supporting local craftsmen and we stay true to that as much as we can. In general, though, no matter where something comes from, what we’re looking for are products made with care and love and skill. All of the makers we work with are very passionate about what they do and that comes through, both in our store and when you bring that work home. Many of the artists who sell at General Store are finding worldwide success. What do you think accounts for the popularity of handmade, small-batch, artisan-quality goods? More and more, people are realizing there’s a benefit to having things that are handmade and high-quality. They care more about who makes the stuff they own, and where it comes from. You can feel the difference between something that’s made by hand and something that’s disposable. A handmade object has a spirit. Once you’ve made the shift from one to the other, it’s hard to go back. John, you launched Outerknown, a surf-inspired menswear line with Kelly Slater, last July. How did the idea for that come about? John: Outerknown is a response to this crazy world we live in. Everything is so noisy, so we choose to build simple, unadorned clothing. And our decision to manufacture responsibly is derived from questioning the norms of our past experiences: I’ve been a designer for almost 20 years, and I’ve seen how dirty the manufacturing process is, first-hand, all over the world. Kelly had been wearing the clothing that his sponsors have given him his entire career, and realized he had no idea how they were being made or what was going into them. He thinks about everything he puts into his body, but had no idea what was going onto his body. So that was our jumping off point. We thought, let’s build clothing we want to wear with a process we believe in. Has your background always been in fashion? Mostly, yes. But I opened a design studio, POP, eight years ago, and that business gets us involved in so many other industries beyond fashion. Hannah and I started it together, along with another friend who still works with me, Yusuke Tsukamoto. Over the years, we’ve had the pleasure of working with many other friends and artists on design projects all over the world—recently, we’ve been working on a sensory deprivation project close to home in Venice, and rebranding a global architecture firm. Let’s backtrack. How did you and Hannah meet in the first place? Hannah: I had a huge crush on him and he had no idea. I would hide when entered the room. John: I would walk in and she would run out of the room. So I never saw her, ever. Then, when I finally got her number, she didn’t return my call for weeks. Finally, we agreed to meet at the store on Thursday night for an event. I walked into the party and got a glass of wine; then she walks across the room, doesn’t say a word, takes the wine out of my hand, drinks half of it, and hands it back to me and starts playing with her hair. That was it. The funny thing is, I work with Ron Herman now, so it’s a true full circle situation. It’s a retail love story. Tell us about your home. What’s its history? John: It was built in 1975, and I bought it months before I met Hannah. She was at the housewarming. It’s taken years to become what it is today, but it has, thanks to her. She’s always bringing things home that she finds. Sometimes I’ll leave in the morning and by the time I come home, things will have evolved. As we’ve grown and changed, the house has, too. Hannah: Some things are the same, but they’ve gotten better over time. We have drawings in our living room and bedroom by Mike Paré, which were the first pieces of art we bought together. At the time, it was such a big deal. It was an investment. I thought, are we still going to like these pieces in ten years? But I’ve only grown to love them more. Weirdly, the one upstairs looks like John, but it didn’t when we bought it—he’s morphing into the man in the picture. As for the house changing, it was a different place when we met. John had a roommate at the time so he could afford the mortgage. We were kids. But we were falling in love, and we figured that whenever John’s roommate moved out, I’d move in. We thought it might be a year or two. But within a month, he left. We looked at each other like, Are we doing this? And we did. I was 23; I was pregnant not long after. It was all sort of by accident, and we figured it out as we went along. We’ve always had a common interest in growing into better versions of ourselves. I think it’s all been a positive evolution. When I told people I was pregnant, they were like, “This is a disaster.” And I thought, no, you don’t know. We’ve got this. Now, 14 years later, you’re still here. Beyond the house, what do you think makes Los Angeles an ideal place to live? John: For me, I think it’s the diverse culture and landscape. You can be in the desert in a matter of two hours. You can be in the mountains or on the beach within minutes. I’ve lived here my whole life and I still marvel at that. Hannah: I like that it’s liberally-minded. I grew up in Arizona, which is known to be conservative, but I was raised in a community completely separate from that. It was a more compassionate place. That spirit is important to me. After this many years in Venice, you must certainly have watched it change. John: Immensely. The creativity and diversity is still all around us. You just have to search harder for it. Hannah: Venice has changed a lot, for better and for worse. Some of the changes are sad to witness, but it’s inevitable: It’s a beach community in Los Angeles; it’s not going to stay gritty forever. Our favorite restaurant, Axe, which was really close to our hearts, closed a year ago. We had gone on some of our first dates there. I breastfed our babies there. That was a real loss. But there’s still so much. We love Gjelina. Blue Bottle. Our local health food store, Rainbow Acres. Places I can pop in and the people there know us. Venice has been good to us. Our kids are here, our shop is here. It’s our home. Thank you, Hannah and John. Visit General Store, Outerknown, and The POP Studio to learn more. For another dose of L.A. living, flick through our archive of tales from the city.